I have a problem to load load schema with Postgresql Adapter . Our client is 192.168.1.x and Server İp 192.168.1.100 for example use 5432 default port. Schema Load is fine everthing is ok. Field List is successfully get in. 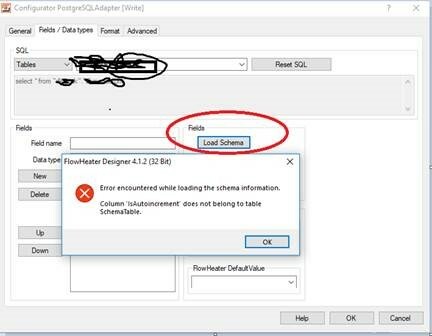 Schema load is failure and i cannot get field list. Print Screen is below. As long your TCP/IP Settings rigth usually it should work. In most cases something is wrong with your TCP/IP or Firewall settings, please verify first. For more analytics I need some more information. Are you able to connect to the desired PostgreSQL server via other tools for example PGAdamin or someone else? Which PGSQL server version your using? Please post both version the local and the remote one.